Asta Funding, Inc. (NASDAQ: ASFI) shares rose 41.2 percent to $10.09. Asta Funding reported a $5.30 per share special dividend. Quotient Limited (NASDAQ: QTNT) shares climbed 37.1 percent to $4.10 following a strong Q3 earnings beat. Cyanotech Corporation (NASDAQ: CYAN) shares jumped 33.6 percent to $5.14. Cyanotech reported Q3 earnings of $0.19 per share on revenue of $9.15 million. Fabrinet (NYSE: FN) gained 25.1 percent to $30.11 after the company posted upbeat Q2 results. Oclaro Inc (NASDAQ: OCLR) shares surged 18.7 percent to $6.70 following a Q2 earnings beat. CECO Environmental Corp. (NASDAQ: CECE) shares climbed 13.2 percent to $4.67. Lumentum Holdings Inc. (NASDAQ: LITE) shares rose 13 percent to $47.15 following better-than-expected quarterly results. Westmoreland Resource Partners, LP (NYSE: WMLP) shares gained 12.8 percent to $2.99. Phibro Animal Health Corporation (NASDAQ: PAHC) climbed 12.2 percent to $ 36.20 following upbeat quarterly earnings. ATA Inc.(ADR) (NASDAQ: ATAI) rose 11 percent to $5.25. ATA entered into a definitive agreement for the sale of its wholly-owned subsidiary ATA Online. Ameri Holdings Inc (NASDAQ: AMRH) shares gained 10.6 percent to $2.08 after tumbling 16.07 percent on Monday. Ameri Holdings disclosed that it has been selected as prime implementation partner for SAP SuccessFactors HCM Module by a major global restaurant group. Skyworks Solutions, Inc. (NASDAQ: SWKS) gained 10.4 percent to $103.3165 after the company reported better-than-expected earnings for its first quarter and announced a $1 billion buyback plan. Centrus Energy Corp (NYSE: LEU) climbed 10.3 percent to $3.67. MediciNova, Inc. (NASDAQ: MNOV) gained 9 percent to $10.30 after dropping 0.74 percent on Monday. Tapestry Inc (NYSE: TPR) gained 5.7 percent to $47.67. Tapestry reported Q2 earnings of $0.22 per share on revenue of $1.785 billion. Micron Technology, Inc. (NASDAQ: MU) rose 5.8 percent to $41.67. Micron raised its outlook for the second quarter and named David Zinsner as CFO effective February 19. General Motors Company (NYSE: GM) climbed 3.5 percent to $40.93. GM is expected to report earnings before the opening bell. Inpixon (NASDAQ: INPX) shares dipped 35.6 percent to $5.03. Clearwater Paper Corp (NYSE: CLW) fell 21.2 percent to $34.85 after the company posted downbeat Q4 earnings and issued a weak Q1 earnings forecast. 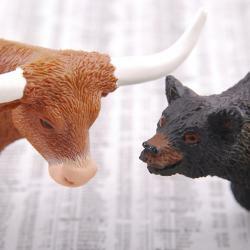 8Point3 Energy Partners LP (NASDAQ: CAFD) dropped 12.3 percent to $12.13. 8point3 Energy reported Q4 sales of $15.8 million and net income of $8.8 million. The company reported a deal to be purchased by Capital Dynamics at $12.35 per share in cash. Vishay Intertechnology, Inc. (NYSE: VSH) shares fell 11.7 percent to $18.62 following weak quarterly earnings. EMCORE Corporation (NASDAQ: EMKR) shares declined 11.5 percent to $5.57 after the company reported downbeat Q1 earnings. Colfax Corp (NYSE: CFX) declined 10.8 percent to $33.62. Colfax posted upbeat quarterly profit, but sales missed estimates. Second Sight Medical Products, Inc. (NASDAQ: EYES) shares fell 10.4 percent to $1.9948 after dipping 41.54 percent on Monday. Veritone Inc (NASDAQ: VERI) declined 9.7 percent to $14.19 after dropping 2.90 percent on Monday. Cboe Global Markets, Inc. (NASDAQ: CBOE) shares dropped 9.4 percent to $114.08. Yangtze River Development Limited (NASDAQ: YERR) shares fell 9.3 percent to $2.923. Perceptron, Inc. (NASDAQ: PRCP) dropped 6.9 percent to $8.62 after the company reported Q2 results. Chinanet Online Holdings Inc (NASDAQ: CNET) shares dropped 6.7 percent to $2.42 after dropping 8.13 percent on Monday. Cirrus Logic, Inc. (NASDAQ: CRUS) slipped 4 percent to $43.12 after the company reported downbeat earnings for its third quarter and issued a weak FY18 sales guidance. The company announced a $200 million buyback plan.